Today we talk to Isabel Hilton, of ChinaDialogue, a bilingual website about the environment in Chinese and English, to find out more about what kinds of environmental issues and actions are going on and being talked about in China. Then we hit the high seas with a Green Screen review of the film “Eco Pirate,” about Paul Watson and the Sea Shepherd. And, in this week’s science short, we visit Great Bear Lake in the Northwest Territories, to find out more about trout, lake diversity and global warming. And, don’t forget the news and this week’s installment of “What’s Happening!”, a segment about upcoming environmental events. 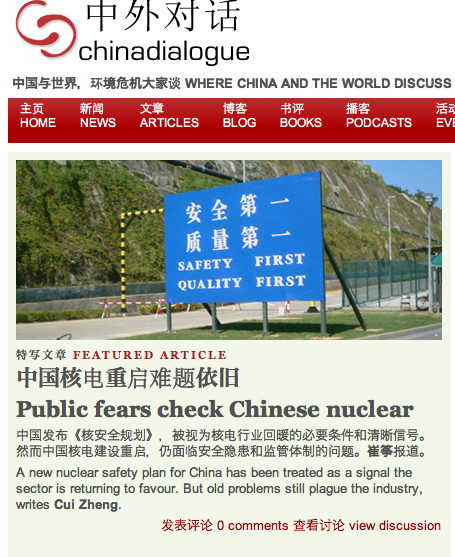 This week, we speak to Isabel Hilton, who is the editor of China Dialogue, a bilingual website about the environment, in English and Chinese. China is brought up a lot as a bogeyman in environmental issues. What we don’t often hear about in Canada is what environmental issues are important within China, what people there think about them, and what action they’re taking. Isabel Hilton is the founder and editor of ChinaDialogue, a website that tries to fill that gap. They’re totally unique in tackling coverage of environmental issues that affect China side by side in English and Chinese. Which issues do they dive into, and which are too hot to handle? How has the experience challenged Isabel Hilton herself? Terra Informa’s Chris Chang-Yen Phillips reached her in London to find out. Today David Kaczan brings us a Green Screen Review of Eco-Pirate. This enviro-documentary from Vancouver’s Trish Dolman focuses on Paul Watson, founder and leader of the controversial ocean-going activist group, Sea Shepherd. Is it green screen gold or garbage? To help you decide, here’s our critical take. In this week’s Science Short Rebekah brings us an interview with PhD student Louise Chavarie about her research on Lake Trout in Canada’s biggest freshwater lake. Great Bear Lake is the largest lake that’s fully within our borders and the 7th largest in the world. It’s situated in the Northwest Territories, where it straddles the Arctic Circle. Louise and Rebekah discuss the contribution of lake trout to the diversity of the lake, and the dangers the lake faces in light of a warming arctic. This week on What’s Happening! There is a fundraising dinner and food drive for the 3rd Annual Unis’tot’en Action Camp against proposed and approved mining and pipeline projects in Wet’suwet’en territory, near Smithers, BC. Canada has been ranked eleventh out of twelve in an international energy efficiency study conducted by the non-profit, American Council for an Energy-Efficient Economy (ACEEE). A pilot project started by the city of Kamloops has a herd of 440 goats being used as weed control. A study released this week focused on the potential of Iron fertilization to sink CO2. An iceberg roughly 120 square kilometers, or about twice the size of Manhattan, broke off of the Petermann glacier earlier this week.